The latest Times Higher Education rankings, ranking colleges by reputation, do not include Irish institutions in their top 100. Ireland's top-ranked universities, led by Trinity College, do not feature in a new list of the world's most highly-regarded institutions. A NEW LIST ranking the world’s universities by reputation has not included any Irish institutions in its top 100. The Times Higher Education (THE) rankings, based on the feedback of 31,000 individual academics from around the world, are dominated by American institutions. Harvard University maintains its status as the most highly-regarded university in the world, ahead of Massachusetts Institute of Technology with the University of Cambridge in third place. Oxford comes sixth, after Stanford and the University of California in Berkeley. The highest-ranked university outside the US or UK is the University of Tokyo in Japan, though its reputation score stands at 35.6 compared to Harvard’s maximum 100. The overall rankings of Asian institutions have risen, a move which will make it more difficult for European institutions to feature in the list. The THE rankings are considered the most authoritative in the world, and had included two Irish institutions in their overall top 100 list for 2010-2011. Last year’s list, published in October, saw both Trinity College and University College Dublin fall out of the top 100, however, with Trinity down from 76th to 117th, and UCD down from 94th to 159th. It ranked University College Cork at between 301st and 350th, with both NUI Galway and NUI Maynooth ranking between 350th and 400th. Queen’s University Belfast was ranked between 276th and 300th. 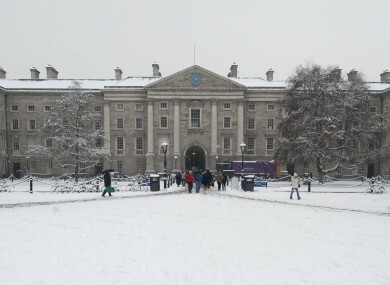 The newly-released reputational rankings, however, do not extend beyond a top 100, so it is unclear how highly regarded Ireland’s universities are considered among the academic community. This year’s reputational rankings were based on detailed responses from 17,554 academics worldwide, up by over 30 per cent on the number used for last year’s inaugural rankings. THE said the survey was distributed to respondents using United Nations data to ensure that its distribution was in line with the demographics of the global academic community. Email “Irish colleges miss out in list of top 100 reputable universities ”. Feedback on “Irish colleges miss out in list of top 100 reputable universities ”.